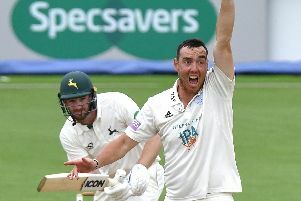 Kyle Abbott shrugged off fears of County Championship relegation after bowling Hampshire to victory over Somerset on Tuesday. The former South Africa seamer took 11 wickets as the hosts wrapped up the division one triumph inside two days at the Ageas Bowl. Only 445 runs were scored in the four innings of the clash as Somerset saw their slim title hopes fade with a six-wicket defeat. Meanwhile, the win gave Hampshire some much-needed breathing space above the drop zone – albeit with three other fixtures still in play. Abbott, whose return of six for 40 in Somerset’s second innings was his fourth five-wicket haul in three matches, insisted talk of relegation was off the table. The 31-year-old said: ‘I haven’t really seen a pitch play like that here. ‘It is unusual because it doesn’t look too different to the other pitches we have played on at the Ageas Bowl. ‘The wickets are playing very strangely at this time of the year which is good for me but not good for the top-order batsmen. ‘We aren’t thinking about safety now. A total of 19 wickets fell on day one as Somerset were bowled out for 106 and Hampshire closed on 142 for nine. The home side added just six more runs on day two before Abbott tore through the visitors to complete match figures of 11 for 71. Since the County Championship campaign resumed last month, the right-armer has taken 30 wickets at an average of 9.83. He pointed to happiness on and off the field as factors in that success, while saluting his partnership with fellow Proteas star Dale Steyn. 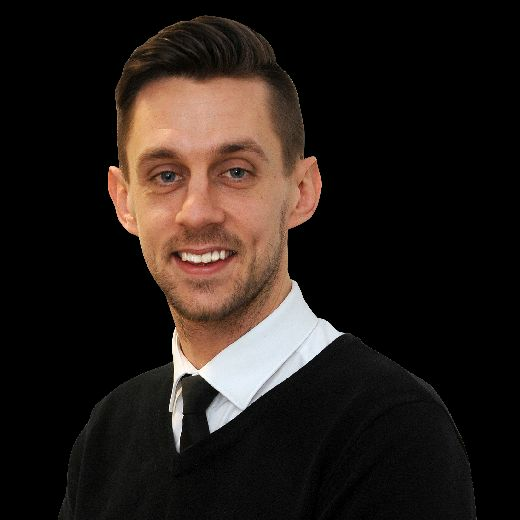 Abbott added: ‘I have made a few changes and it has been great. ‘I have got my confidence back and I am so happy off the field, which makes a huge difference. ‘I feel when I run up I can take a wicket with every ball and the nice thing is I don’t know whether it will be edged, bowled or leg before wicket. ‘I had a good partnership with Dale when we played Tests for South Africa and it has been nice to chat with him about those times over the last few weeks. 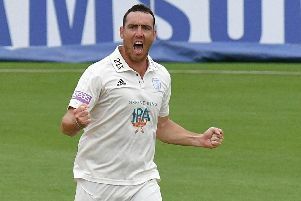 Set a target of 75 for victory, Jimmy Adams steered Hampshire home with an unbeaten 25 – completing the win inside five sessions.